September 27, 2017 Emily McIntyreLeave a Comment on New APPetite, who dis? Today is a special day, because you are about to read my diary. Ha, no, not that diary (I know, bummer)… I’m talking about my diet and exercise diary. I would call it a journal, but it’s more personal, not to mention I write and say the word “journal” all the time because I’m a journalist. Ya feel me? 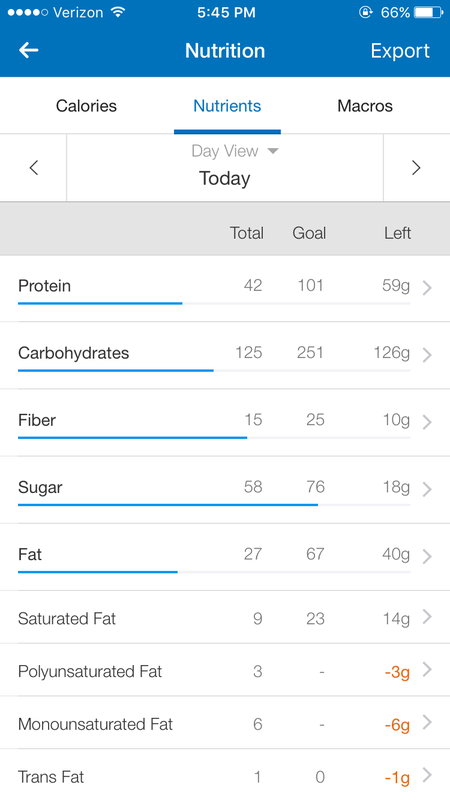 My diary is really just a free app called MyFitnessPal, which I have been using for nearly a whole month now. My doctor (who’s also my aunt– check her out on Cleveland Magazine’s Top Doctors list for the third year in a row!) recommended it to me, and I love it. All you have to do is set up a quick, super simple profile— and track every morsel of food that you eat. And track your exercise. It sounds annoying to have to do, but trust me, it takes literally a minute of your time. Compare that to how many hours we spend scrolling through social media each day. There’s really no excuse for me to not log what I’m eating when MyFitnessPal is right next to the other apps! Tracking everything into this small-yet-mighty diary took about a week to become a habit. I’ll admit to you right now that I’m a boredom/stress eater, so initially it was incredibly difficult (and kind of defeating) to have to stop on my way to the pantry or fridge and think wait, I’m going to have to log this. And I don’t believe in swearing off anything completely, so I just eat less of that junk food I’m craving by measuring out the actual portion on the package. Perspective is everything, people! 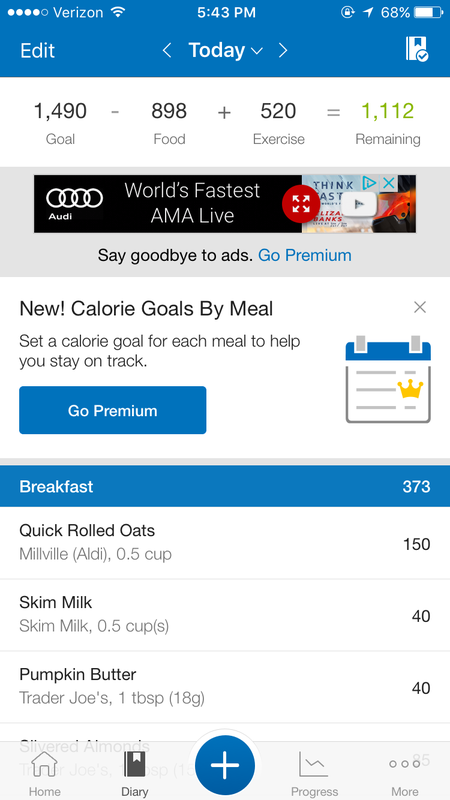 Every time you open the app, you see how many calories you have remaining for the day. This is especially useful as a visual reminder when you know you’ll be splurging later on that day. For example, on Saturday I knew I’d be going out to dinner with my dad, so I ate really healthy at lunchtime to save calories for a burger. …And nutrients, too! 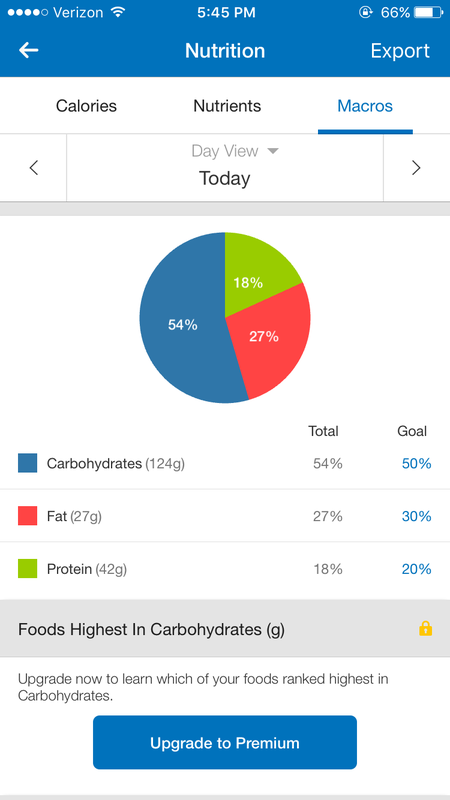 My current macronutrient calorie goals are to have 50 percent carbs, 30 percent fat and 20 percent protein. I’ve realized I need to be more careful about my sugar and salt intake, because I usually go over. There are multiple serving sizes/units to choose from, depending on the item. Measure your morning cereal in cups, milliliters, tablespoons, grams and more. But just know if you measure your Cheerios in milliliters, I’m totally judging you. “You haven’t logged your Lunch for today. Would you like to do it now?” Ah, the beauty of virtual reminders to keep you accountable. Nuff said. 95% of what I eat is already registered into the app. From Aldi’s Greek yogurt to the Sesame Soy Ginger Vinaigrette at Trader Joe’s, I can find (just about) everything I eat on there. And if it’s not? You can create an item. It’s ridiculously user-friendly. I can’t rave about MyFitnessPal enough. It has been working wonders for my weight loss, and I love being able to visually track on the screen— not just in the mirror— how far I’ve come. Today marks my 25th consecutive day of logging. I’m going to celebrate BIG when I reach 100! And now for the moment you’ve all been waiting for: an inside peek at my juicy, indulgent diary. I hope you read it and weep become inspired to try MyFitnessPal too!